Students have long played an important role over the past decades in shaping the struggle for democracy in Burma. 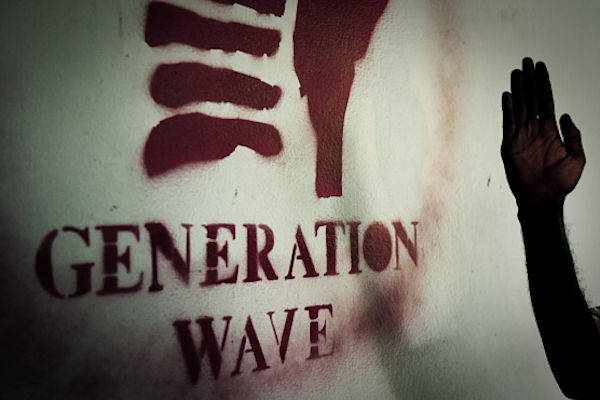 Generation Wave are just another generation of those students that came before them, standing up for what they believe in, in spite of the severe repercussions they face – you can read more about Generation Wave here from a previous post on this blog from a couple of weeks ago. 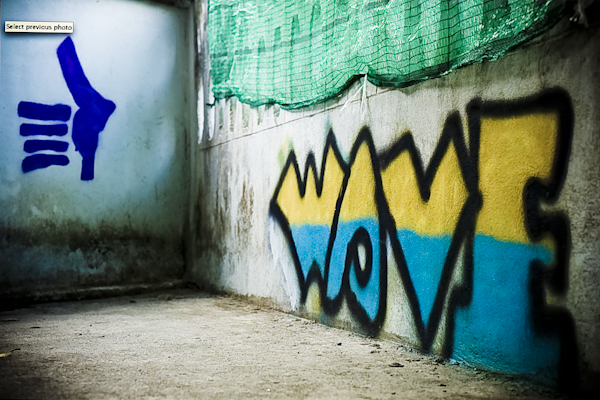 I’ve been staying here at the Generation Wave safe house with my little sister and the rest of GW for much of the past two weeks – it’s quiet, away from the prying eyes and I can get a lot of work done as well as relax and have some fun at the same time. Today we decided to do just that and tried some portraits – they were keen to try to include the style in my political prisoner portraits and it’s quite funny really when you think that their logo is also a hand, so I came up with an idea to use it to cover their faces in the portraits (they have to remain anonymous for obvious reasons). In trying to make the most of this extra time here on the border it just constantly seems that there is never enough time. Meetings that just never seem to happen meaning that my plans to get to Chiang Mai and catch up with Rachel, and friends at Chiang Mai and DVB are likely to be put on the back burner again and may not happen at all this time which is a shame. The week has been busy with re-editing and re-shooting mixed with plenty of “R ‘n’ R” mostly over at Generation Wave’s HQ where I’ve been staying for a bit. So far this week I’ve retaken a number of portraits and yesterday and today once again we managed to do U Sandawbartha (16 years in Insein and Tharawaddy prisons), Moe Myint (12 years in Insein prison on 4 occasions) and Dr Tun Thu (8 years in Insein and Tharawaddy prisons). 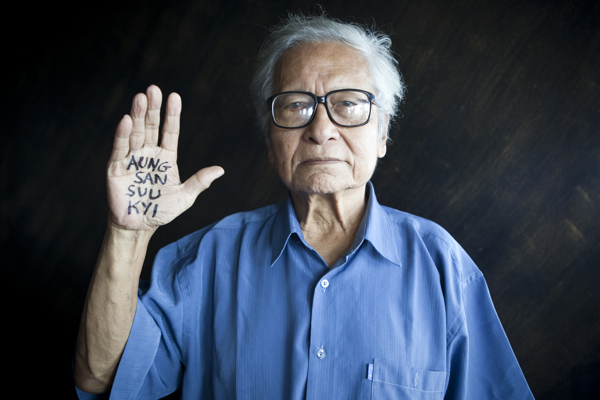 Unfortunately Dr Tun Thu has been suffering from what is possibly a serious case of post traumatic stress syndrome due to his time as a political prisoner. Last year when I met him he was fit and healthy and working as a doctor in the Mae Tao clinic. In the months in-between I was very sad to learn of his failing mental health and he appears to have suffered very badly indeed. But meeting him now it would actually appear that he is hopefully turning the corner. One can’t begin to imagine how the mind has suffered through years of torture and abuse as a political prisoner. The body can show you the scars of pain but it’s what’s inside that can so often be so much more painful. There is no support system for former political prisoners other than their friends and colleagues here on the border. But there is possibly hope that comes in the form of the ‘Borderline Project‘ for former political prisoners which is a proposal to form a safe house, training and rehabilitation project here in Mae Sot and is being set up by my friend Thiha and Markus Baude. It is an excellent proposal and I can only hope that they are successful in their search for funding… I know how difficult that is (not one penny funding received yet for this project – ed). Also I’ve been busy with more UNHCR work today and will continue tomorrow as well as interviews need translating and more need to be taken… but still no response to my requests for a meeting with the UNHCR office themselves. Today I am inspired. In part obviously because of the superb article printed yesterday in The independent Magazine which provides a great platform to take things forward, but also because of an incident last night. Whilst out celebrating the publishing of the article we were unfortunately targeted in a case of mistaken identity… but maybe not mistaken, who knows. Either way it was unfortunate and resulted in an incident which has knocked some inspiration into me (as well as a few bruises). No harm done at all in reality and no need to waste any space here talking about it as I’m going to be busy re-editing 35 portraits I took last summer at the AAPP office. They’ve been bugging me for some time, I love most of them, but they have ended up as square portraits whereas all the others are now landscapes – which isn’t exactly traditional for a portrait but in my case it works for what I want to say and what these photographs portray. Anyway, all is now looking good as I’m inspired and have got the trick to re-work them… more work but so worthwhile. The build up to today really started last Thursday during Thingyan. As we were all out partying away in the Reggae bar my phone started beeping – incoming texts from Andy Buncombe in India… “Is it ok now to say you’ve just been to Burma? Looks like it is on the cover. Will know tonight”. One hour later and it was confirmed… “Am told Win Tin is going on the front! They are using 18 of the portraits! Full Colour too!”. Today was the day that the world would finally get to see the one portrait we have had to keep under wraps for 9 long months – but now it’s the real birth of this campaign. I met U Win Tin in Rangoon during summer 2009 at the time of Aung San Suu Kyi’s trial – you can check back to the date on this blog by clicking here to read about it. To say it was a highlight is an understatement. He is an icon. My Hero. Meeting him was one of the greatest moments of my life. Naturally I can’t go into all the details of how, where and why, but to some it may be apparent anyway when you look at the photographs here. We spent about an hour chatting before I took his portrait – it was truely mesmerising, he really is a remarkable man. They say there are moments in life that change your way of thinking. This is a moment that simply changed my life. There were so many moments that linger long in my memory – but perhaps the funniest was when after an hour of talking suddenly someone appeared outside the large glass windows in front of where we were sitting, pretending to clean them but with eyes fixed firmly on me and U Win Tin. The thing that made me laugh was that we were 20 floors up and it was pouring with rain. Military Intelligence will stop at nothing! The interview that I did with him was published in the Irrawaddy in August last year under one of my pseudonyms Tom Parry (one of many like James Mackay !) – you can read it here. At the time that we met it was a very different situation as Aung San Suu Kyi was about to sentenced and U Win Tin’s own personal safety was under threat of imminent re-arrest due to his continued outspokenness over the treatment of Daw Suu and the current situation. We were going to publish the photo on the morning of the verdict in Aung San Suu Kyi’s trial – it would have been front page in The Independent but also would definitely have seen U Win Tin returned straight to jail, most likely under the archaic Electronic Act. We had to pull the plug at the last moment and it was the right decision despite the risks we had taken to get the shot. I was sure the time would come again when it could be used in its own right and not off the back of another event in Burma and sure enough here it is. 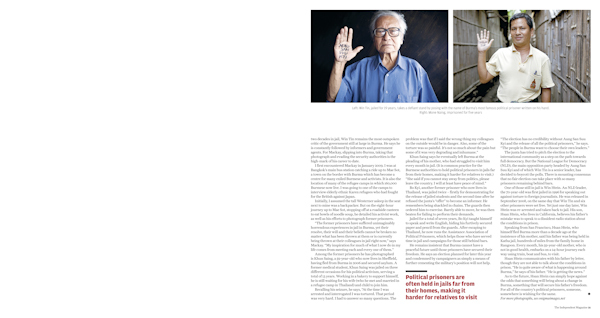 A feature article about Burma’s political prisoners lead by their most famous Uncle, Saya U Win Tin. I owe a massive debt of gratitude to Andy Buncombe for his continued belief in this campaign and me – he was as determined as me that one day we would get the story out – but I could never have expected it to have been in this fashion and to have front cover and 5 full pages inside with 18 portraits is more than I could dream of – but it’s only any good if it does any good. We need to keep the issue of political prisoners firmly in the spotlight. Nothing less will do. I spoke with U Win Tin this morning to share the wonderful feeling at seeing his image staring out proudly at the world with the name of Burma’s true leader marked clearly on his hand. He was delighted and excited that finally our moment from last year can be shared with the world. You won’t be buying this edition of The Independent anywhere in Burma, but be sure that he has his own copy. (We had spoken several times in the past few weeks to confirm he was 100% happy to go ahead with publishing the image despite the risks he may face and he was adamant it must be published. Above all else U Win Tin’s safety was considered more than anything – for me it was and still is the most important thing, but he was crystal clear in wanting this image to be shown to the world). And under those orders, here it is. The image that will now go on to lead this campaign for Burma’s Political Prisoners in the build up to the elections later this year. You can expect some more very exciting big news soon.. In a safe house in Mae Sot, we sit chatting and laughing about an extraordinary incident that happened in Burma just last week. I was there on a flying visit, working undercover on this campaign but not even in my wildest dreams could I have expected it to happen. Playing tourist for the moment, but still very clearly being watched, I stood away from most prying eyes in a far corner of the concourse that surrounds Shwedagon Pagoda going through the motions of taking photographs of the beauty around me. I turned around and was immediately frozen to the spot. There sitting right in front of me was Kyaw Oo, a member of Generation Wave who I had been with in Mae Sot just days before arriving in Burma. A casual glance to each other but no more, as this was most certainly not the time or place to continue where we had left off just days earlier! I think winning the lottery would have been more likely than this – even writing about it now I still can’t quite believe it happened… but i believe it was a good omen because my trip was successful and so to was his and here we are both now sitting in the evening heat of Mae Sot laughing about it. In the aftermath of the Saffron Revolution a new youthful student force was born. Five former high school friends galvanised by the demonstrations that they took part in and the events on the streets of Rangoon that shocked the world started their own underground organisation. Generation Wave was founded on 9th October 2007 by Zay Yar Thaw, Aung Zay Phyo, Nyein Nwae, Moe Thway and Min Yan Naing all of whom were actively involved in the students demonstrations in 1996 and 1998. 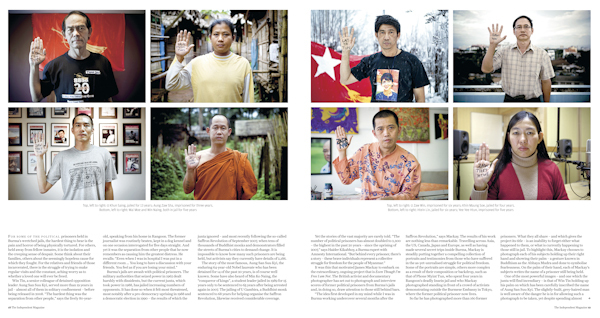 Over the last two years they have carried out a number of high profile campaigns inside Burma – including pamphleting, grafitti, daring protests outside Insein prison and distributing CDs of their music in tea shops. But at some price. There are currently 21 members of the group in jail in Burma including Zayar Thaw, Arkar Bo, Aung Zay Phyo and Thiha Win Tin. Two thirds of their members are behind bars for promoting democracy in their country. It’s made even worse when you consider their age. For the full picture on Generation Wave please read this in-depth interview with them here in this great article by my friend Joseph Allchin from DVB. There are currently only a handful of GW members living in exile here in Mae Sot (obviously names and details can’t be divulged for security reasons), including one, let’s call her ‘Nyi Ma’, a very old friend of Jackie’s when she was living in Rangoon. They had not seen each other for more than 10 years and we all met in complete surprise for the first time since then during the AAPP tenth anniversary last month. With that first coincidental meeting with a member of GW I suppose I really shouldn’t have been surprised when I bumped in to Kyaw Oo in Rangoon! So other than just enjoying spending time with friends at Generation Wave HQ, I’m also here to take the portrait of the only member of GW who is a former political prisoner. Kyaw Oo has been jailed twice for his political activities – in 1989 for 4 years and again in 2008 for 1 year – both times in Insein prison. He was released in the General Amnesty on September 19th 2009 and now lives in exile here in Thailand. You can see the portrait we took here on the main website. I have been lucky enough to spend a lot of time with Generation Wave over the past few weeks (often just having a break from what I’m doing and hanging out with my little sister and co has provided me with the space to find new ideas and inspirations). And it has proved so very inspiring to spend time with them. In fact I’ve got some ideas for some portraits for them all so we’ll have some fun next week for sure. Despite being too old to be a member I have been given the great honour of having my own numbered mug (the only non-member with an official place in the dishrack!) – so if you’re ever at their house and you see number 10 left lieing around half filled with unfinished coffee you’ll know it’s me! The Student movement has long played the decisive role in shaping the fight against the military regime and like so many that came before them, they are the new generation of students, still fighting for their country, but a long long way from home. I am officially a refugee. Or maybe more of an IDP. I was supposed to be leaving Thailand in 3 days… not anymore. Late last week a volcano erupted again in Iceland sending plumes of volcanic ash into the sky and bringing a halt to all flights in Europe. It first erupted on March 21st having been dormant for more than 200 years but now it had got angry and has brought Europe to a grinding halt which means I’m not going anywhere fast. After spending 3 hours trying to get through to Emirates office in Bangkok I finally managed to re-schedule my flight – for Monday 2nd March!! A 10 day extension to this trip is obviously very welcome as there is plenty to do but it throws a few spanners in the works (quite literally with work in the UK). But its settled for me and now I can carry on with all the blog writing I’ve been busy doing last week and also with the editing of thousands of photographs. So what was going to be a frantic last few days here in Mae Sot has now turned in to a much more enjoyable timescale allowing me to hot-desk from my work places at AAPP to DVB to GW and back again as much of the background work can be completed at a more relaxed and obviously enjoyable pace. With any luck we’ll get the chance to take a few more portraits as well! Three days of partying are starting to take their toll – thank God today is the last day of Thingyan! Yesterday afternoon a bomb went off in Rangoon and it wasn’t really until later into the evening that we had a clearer picture of casualties. Jackie had called me in the afternoon as her sister had been down there – thankfully she was fine, but many others weren’t – it seems 5 or so people have died. The bizarre thing is if I had stayed on in Rangoon I would have been in the exact area where the bomb went off… plus it was the exact location where I had bumped in to a General and his entourage on Monday afternoon. coincidence?… definitely food for thought in my book. Also last night I got the final confirmation from Andy Buncombe at The Independent that the big article about my work would run in the magazine next saturday on 24th April – plus U Win Tin on the cover (read more here). So there was a reason to really let the hair down last night and it went on late as usual… Aiya, Reggae bar, Khungs… all the usual places and all the usual fun with my little sister Nyi Ma Ei Ei and all her crew. So the final day of partying away at Aiya with everyone. I wish Jackie was here to enjoy it but we will have to make sure its on our schedule to be here next year if we can’t all be back in Burma to experience it for real. A quiet end to the evening with dinner in the night market with Thar Gyi and Aung Khaing Min. It’s been a well earned week of relaxation (with a splattering of work at times during the day… can’t keep the camera down for too long!) but it’s back to work on Sunday as we’re heading back to Umpiem Mai camp once more. Yesterday in Bangkok was very surreal – for a city that is vibrantly hectic 24 hours a day it was serene and silent as Thai New Year festivals got underway. Songkran’ in Thailand or ‘Thingyan’ in Burma is like no ordinary new year celebration where people just get drunk and party for one night. This is four days of hedonism and celebration all round and this is my first taste of it. But Bangkok was experiencing an altogether different sort of shutdown as the red shirt demonstrations seemed to have turned a different corner in the few days that I was out of the country. With tyre barricades now erected behind lines of bamboo poles I was glad to be heading out of Bangkok and back to Mae Sot where I could party with friends. Getting a bus was of course another trial altogether but so typical of Thailand… when i got to the counter at Mo Chit terminal there were no VIP bus seats left. No problem I’ll travel first or second… “one seat left in first” I was told. Ok… i’ll take it but how much? “No room now” I was told… “you go second class”… No point in arguing, even though the screen showed an empty first class bus – I just want to get out of this city as soon as possible. Thankfully I got the ‘last’ in second class (of course at the back right above the engine!! Anyway those were the trials and tribulations of dealing with Bangkok yesterday and now back here in Mae Sot it’s time to put my feet up for a few days and enjoy Thingyan with everyone else. Apart from a few hours work in the morning just catching up with some writing, emails and some images to be sent to certain people, the laptop and cameras stayed firmly in their bags – just as well as you cant walk more than 10 yards without having a bucket of water thrown over you! Headed down to Aiya in the mid afternoon to see who’s there and met up with Ei Ei and spend the rest of the day and evening partying away with Generation Wave and what felt like about a hundred other people packed into the bar – water everywhere – music pumping and beer almost cold. Happy New Year to one and all. When we first arrived in Bangkok on March 20th the red shirt demonstrations had just started the day before and Bangkok was a carnival atmosphere with thousands in cars and bikes on a friendly procession the rough the main streets. Now some 3 weeks later we’re back in Bangkok (after a short break on a beach!) and Sukhumvit is awash in a sea of red – the shopping centres are all closed and the Ratchaprasong intersection now resembles Glastonbury rather than the centre of a one of the biggest and busiest shopping districts in SE Asia. The main section of Sukhumvit is now closed, there are are thousands of people here, food stalls, music, stalls selling everything you can think of in red, a massive stage and it’s right here in the middle of the tourist and shopping heartland of Bangkok – only MBK is still open – it’s incredible how this has been allowed to happen and I already fear how it may turn out in the coming weeks – there are some very pressing issues at the core of Thai politics and society that need to be addressed and maybe now they are starting to come to a point of no return. Only time will tell. This morning Jackie flew back to England as she is unable to join me on the next part of the trip into Burma – we started this trip with the release of Nyi Nyi Aung and I don’t really want to end it with the arrest of Miss J San. The day is spent running through final checks, and final meetings before flying into Rangoon tomorrow where I am hoping my ‘Visa on Arrival’ will be waiting for me with no problems. Arriving back at the hotel later in the evening I am handed a letter from the hotel management (see below) informing me that there has been a ‘State of Emergency’ declared by the Prime Minister and public gatherings of 5 or more are outlawed!!! Welcome to Burma one day early! !